170 Carter Avenue | Louisville, Kentucky 40229 | 502-955-1010. Fire Studio is currently the oldest and only operating glass studio located adjacent to the bourbon trail in Bullitt County, KY. The studio was built to be a creative glass studio & gallery with an emphasis on educating the public on the art of glass blowing. The 6000 square foot studio and gallery located just South of Louisville opened in 1996. Fire Studio operates 50-60 hours a week, producing hundreds of pieces that are sold in galleries, gift shops, and boutiques across North America. We have a small, but experienced staff of five, including three glass artists who have almost 50 years of combined glass blowing experience. Even though Fire Studio uses modernized equipment, the essence of working with glass remains an ancient art. Our visitors watch as Fire Studio artists mold 2125˚ hot liquid glass using a process requiring a creative mind, dexterous handwork, and stamina to create lasting glass objects of desire. 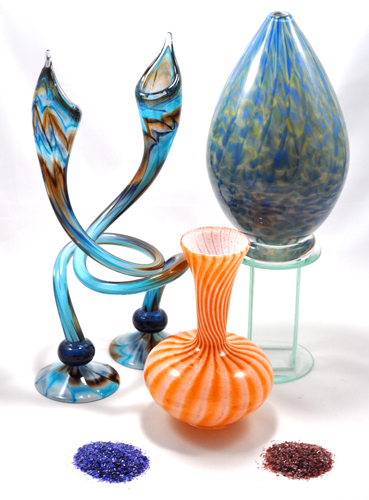 Throughout history, the basic knowledge and techniques of glass blowing have been highly coveted and held sacred. 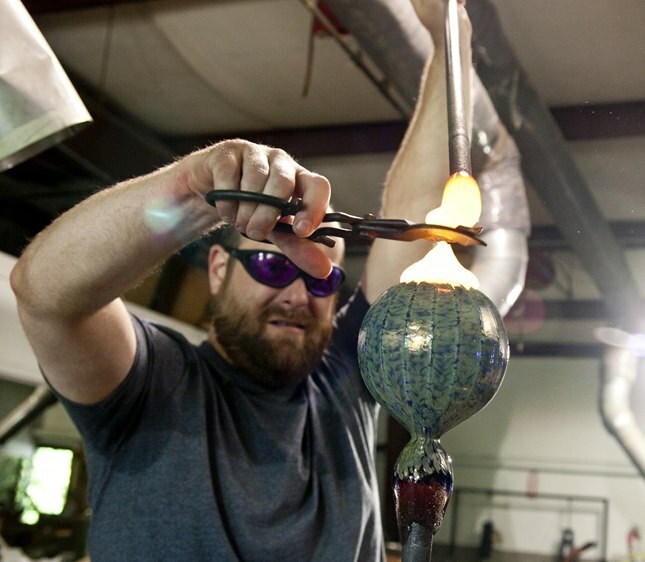 During our studio tours, Fire Studio artists will walk you through those basic steps of the ancient art of glassblowing. For our tours and create-your-own glass masterpiece, no previous experience is required and our sessions are available for everyone. You choose from 2-3 colors, the color pattern/design, and then enter the hot glass studio with Master Artist, Mike Hudson. Mike will do all the hot, technical part, while you use your own breath to “inflate” your masterpiece! Would you like to make a tour extra special and add on a Create Your Own Glass Masterpiece for a group? Call us for details and to schedule an appointment at 502-955-1010. Please be aware items cannot be taken home the day of the activity. Your glass masterpiece needs to cool properly. Pickups can be made the next morning or Fire Studio is happy to ship to you for a nominal fee. Our memorial glass keepsakes are lovingly produced with molten glass and a small amount of cremated ashes of a loved one or pet. 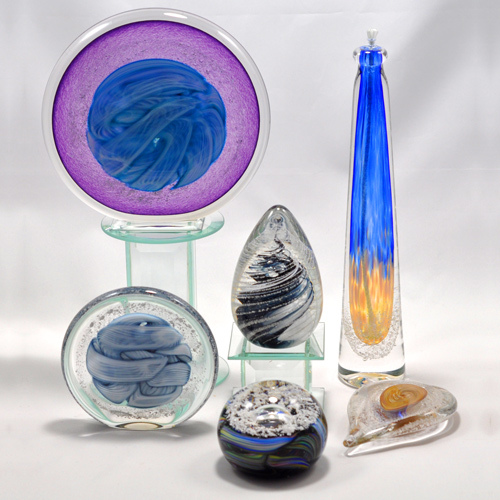 Your keepsake will be create with the help, special care, and attention from our master glass artists. If desired, you can even have a part in the creation of your beautiful tribute for your beloved relative, a dear friend, or a cherished family pet. Each keepsake is customizable with a wide variety of styles and color choices. Prices vary per keepsake item. Contact us at 502-955-1010 for further information and about this very personal event. Did you know elegant glass artwork can be created from the sand used in a Wedding Unity Sand Ceremony? By combining special colored art glass sand, provided by Fire Studio and Gallery, the result of this powerful ritual can be created into a beautiful bowl, candlesticks, vase, sculpture, or a multitude of other items. Or, you can order a custom handmade glass vessel to be used at your Wedding Sand Ceremony to contain your sand. Make an appointment to stop by our gallery to pick up your special glass sand. A $30 deposit is required to select your two colors (additional colors are $10 each) to be used on your special day. After your wedding, simply bring the combined sand back to Fire Studio and Gallery to create something beautiful that will stay with you throughout your marriage. You can assist in the creation process or select an object for our master artists to create just for you. Or stop in and see our wide selection of vessel options for your Wedding Ceremony. Call ahead to 502-955-1010 to reserve your special day and time. Prices vary depending on design and piece chosen. Add beauty through handmade glass to your home, office, restaurant, or studio with a Hudson Glass Wall Installation. Created from multiple colored handmade glass disks, the art is arranged on any accent wall or space where an art element is desired. Sizes, shapes, and colors are all custom to match your décor. Contact us for details and more information at 502-955-1010. Reward your employees with beautiful artwork. Handmade Glass Corporate Awards – the perfect way to reward outstanding employees – artwork they will cherish forever. Our handmade glass corporate awards will make a statement with your staff and show true appreciation. Choose from several designs ready to create in your corporate colors or contact us to create your own custom designed corporate awards. Prices vary; contact us for more information at 502-955-1010. Fire Gallery Retail Store carries a huge assortment of glass artwork. Whether you are looking for a gift or just something special for yourself, shop our beautiful gallery with hundreds of handmade glass art pieces. Outlet Department– Shop our special outlet section with irregular and markdown items – all at discounted prices. Bring your special occasion to Fire Studio and Gallery! An event at our Studio and Gallery will make any type of party fun and memorable. We have a large space with lots of seating and refrigeration storage for any food or drink. If desired, Fire Studio and Gallery can also help connect you to local caterers. Looking for a stop on the Bourbon Trail? We are located adjacent to the Bourbon Trail in Bullit County, making us the perfect place to party along the way. If you want to make your event more memorable, add a Create-Your-Own Glass Masterpiece so everyone in your party can create something special to remember your event. Contact us for details. Contact us for room rates and to schedule your event – 502-955-1010. Bring your special occasion to Fire Studio and Gallery! An event at our Studio and Gallery will make any type of party fun and memorable. We have a large space with lots of seating and refrigeration storage for any food or drink. If desired, Fire Atudio and Gallery can also help connect you to local caterers. Looking for a stop on the Bourbon Trail? We are located adjacent to the Bourbon Trail in Bullit County, making us the perfect place to party along the way. If you want to make your event more memorable, add a Create-Your-Own Glass Masterpiece so everyone in your party can create something special to remember your event. Contact us for details. Fire Studio has a large selection of tours for you to choose. We offer everything from a simple walking tour viewed through our studio windows, to a guided tour out in the glass blowing studio with live demonstrations and create-your-own glass masterpiece opportunities. Do you have a group? We can accommodate any size group; please call ahead so we can be prepared to offer you the very best experience. Need a special time outside our listed hours? Call us to make arrangements and schedule. Questions? Call us at 502-955-1010. Please call ahead to schedule tours or inquire about our next available tour. School Tours – please call for pricing and further information. Watch through our special viewing windows as amazing artists sculpt 2125˚ hot glass right before your eyes! Then shop our beautiful gallery featuring many examples of amazing glass artwork and functional art. Available during regular open hours, call 502-955-1010 for best times to view glass blowing. This tour offers the expertise and knowledge of the working glass art studio with Master Artist, Michael Hudson. Michael showcases and explains the art of glass blowing. You will learn the extensive nature of artistic glasswork through demonstrations viewed from our glass viewing areas. After, you can take your time and browse Fire Gallery’s fine handcrafted glass objects and artwork. By appointment only, call to schedule your experience 502-955-1010. This tour takes you in to the actual art studio with Master Artist, Michael Hudson. Michael showcases the art of glass blowing while performing a live studio demonstration. Learn the extensive nature behind artistic glasswork through the entire studio staff. Then you can take your time and browse our gallery of fine handcrafted glass objects and artwork. Looking for lunch? We can add on Box Lunches! Enjoy a Delicious Box Lunch in our Gallery or Outdoor Patio! Fire Gallery is climate controlled and offers table seating. Our covered outdoor patio seating area is also available when weather is permitting. Call us for our menu and drink selections. FOR THE BEST EXPERIENCE POSSIBLE, PLEASE CALL AHEAD TO SCHEDULE TOURS AND DEMOS.